The 2016 GSA membership year is off and running, and we ask you to renew your membership today—or to join us for the first time. GSA is THE professional society for faculty, postdocs, grad students, undergrads, educators, and others interested in genetics. The Society’s more than 5,500 members worldwide work to deepen our understanding of the living world by advancing the field of genetics, from the molecular to the population level. Many of our members use model organisms from Arabidopsis to zebrafish in conducting their work, and GSA is a strong supporter of the model organism communities. Your membership enables the Society to continue to advance scholarship in genetics, to convene you and your fellow researchers, to foster the careers of the next generation of geneticists, to communicate the value of research and of model organisms, to advocate on behalf of the genetics community, and much, much more. 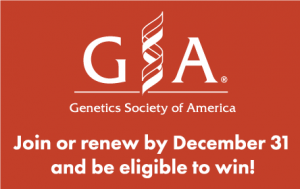 GSA members receive a long list of benefits, including registration fee discounts at GSA conferences, reduced publication charges for publishing in GENETICS and G3: Genes|Genomes|Genetics, eligibility for Society awards and travel grants, and the ability to help select the Society’s leaders and serve on committees. Those joining or renewing their GSA membership before December 31, 2015, will be entered into a special drawing to win prizes including an Apple Watch, FitBit, complementary registration to The Allied Genetics Conference, or a $50 Amazon.com gift card.